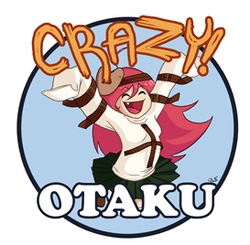 To take over the world through anime, manga, and fan comics! That is the primary goal of C.R.A.Z.Y.O.T.A.K.U.! C.R.A.Z.Y.O.T.A.K.U. was consummated back in 2004 by Ben Schoedel (also known for the official There She Is fan panel and As The Otaku Grows) with one thing in mind: To entertain convention attendees, help them grow in their fandom, and to have them leave with an experience they will always remember. This goal has been met year after year through the employment of flying confection, a plethora of unique games varied in all areas in fandom, making it so anybody can win (no matter how experienced or inexperienced they are), and prizes that make any fan salivate. C.R.A.Z.Y.O.T.A.K.U. stands for Co-operation for the Realization of Anime Zealous Youth through the Organized Teamwork of Anime Knowledgeable Unions. C.R.A.Z.Y.O.T.A.K.U. is currently staffed by it's crazy co-leaders, Ben Schoedel and Maryellen Sloan, the notorious flasher (our camera man) that has been there since day 1, Jay Joseph Jr., and the group's newest resident oddball, Keith Levinson (also known from The Super Mario Super Panel, Geek Law, and Panel in a Half shell). From a humble beginning in a small room at AnimeNEXT04 with under 10 attendees watching to current day where they travel from convention to convention and perform for thousands, C.R.A.Z.Y.O.T.A.K.U. continues to grow it's army every year! They shall continue to grow until the earth is theirs! Then onto the stars themselves! Add or Update Information for C.R.A.Z.Y.O.T.A.K.U.